The weather of late has certainly been frightful, putting a bit of a damper on thoughts of spring; but no winter lasts forever, no spring skips it’s turn. I could find all kinds of quotes to help us turn the tide of this seasonal impatience, but it will come when it will come. In the meantime, there are still lots of things to keep our green thumbs busy while we wait for warmer weather and thoughts of lovely spring flowers to help us forget our frozen misery. This past weekend was a great opportunity to be inspired at the Calgary Home & Garden Show. Maybe the kiddies got in some play time on our Rainbow Play System, your dreamed of winning our Dream Yard Package, took the opportunity to save with our Show Specials or just was able to chat gardening with our Blue Grass team. Thank you to all who took a moment to stop by our booth. Spring plans can be created by following a calendar of tasks, designs drawn from inspiration, reading the stars or just going with the flow of what the season brings. If you are planning on starting your own seeds however, it is important to come up with a bit of a plan. There is a rhyme and reason for choosing appropriate seeds, how to choose and when to get them started. When making your choices make sure to read the label, there is a lot of great information including when to seed, how to seed, growing instructions and days to maturity. Dates to consider are calculated from last spring frost, less days to grow indoors. For example, on average our last frost-free date is May 23rd and nasturtium require 3 weeks indoors, my start date will be May 2nd. Watch for reminders on our social media pages and stories, we’ll help keep you in the growing loop. We have a great selection of seeds, seed growing supplies and accessories readily available in our Garden Centre and our Summer Bulbs have arrived! Dahlias, gladioli, lilies, cannas and many more are now available. Check them out in store soon, limited varieties are available. 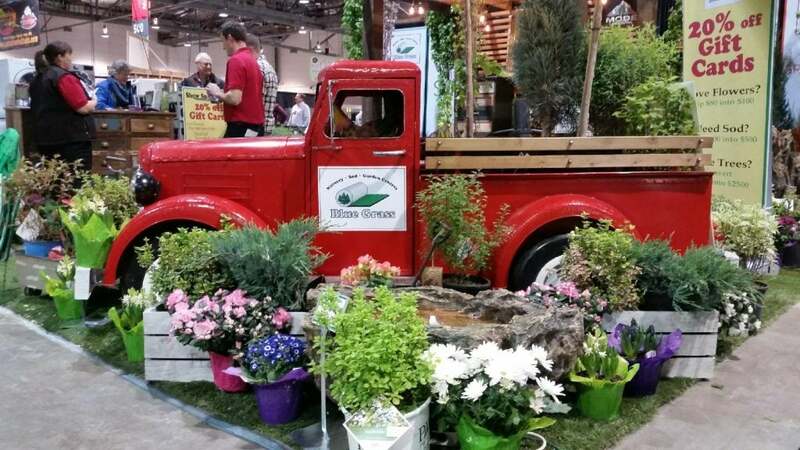 Spring garden décor, pots, raised beds, fountains, furniture and new products for 2019 are all set up in the Garden Centre for you to help with your spring planning. Also, if you missed out on the Gift Card Special at the Home & Garden Show, you’ll be happy to hear that you can still get a deal on Blue Grass Gift Cards through to April. Buy your Gift Cards now at 10% off to use later in the season. Jack Frost may be trying to keep us down, but we are a hardy and determined lot of gardeners in the Prairies, and as soon as the winter gates start to thaw, we will be eagerly at the starting line ready to grow! Need help planning, stop in and talk to any of our staff; we can help turn your dreams into reality! Thinking warm thoughts and wishing you a happy March!